Criminal justice schools in South Dakota are training the next generation of crime fighters, who are needed to combat the recent upsurge in crime. According to crime statistics released by the state, there were 71,000 offenses committed in South Dakota in 2015—up nine percent from 2014—making it imperative to get more highly-skilled criminal justice graduates on the street and in the courtroom. This guide outlines what prospective criminal justice students need to know about schools in the state, such as the jobs that are commonly held by graduates, the salaries these professionals command, and how job growth in South Dakota compares to other locations. Read on to learn more about academic and professional opportunities in this field. After Criminal Justice School in South Dakota: What's Next? In order to begin a career on the right foot, it’s important for criminal justice students to attend a reputable school. Students are able to pursue various careers in criminal justice through schools and programs throughout South Dakota. To help students know which school is best for them, we have ranked schools across the country based on important factors such as tuition cost, total enrollment, acceptance rate, and student-teacher ratio. 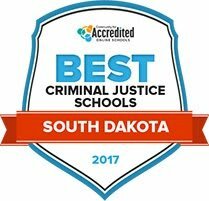 Explore the top criminal justice schools in South Dakota for 2017 here. Southeast Technical Institute's Criminal Justice Associate of Applied Science degree takes a minimum of 72 credits to finish. Leadership, critical thinking and oral and written communications skills play a significant role during the training. Instructors encourage students to sharpen each of these skills. To meet graduation requirements, students majoring in criminal justice must also pass a certification review prerequisite class. This class is worth 1 credit. Before they graduate, students are required to pass the South Dakota Law Enforcement Standards and Training Commission Reciprocity Training test. The youngest that exam takers can be is 21 years of age. Western Dakota Technical Institute's criminal justice associate's degree is structured to meet the training needs of adults who are either currently working in or who want to work in the criminal justice field. There are classes that cover criminal law and constitutional law. However, the program is not geared toward adults who want to work solely in law. Ethics in criminal justice, forensics and criminal investigation are other subjects covered during the program. The admissions process requires prospective students to submit high school transcripts, immunization records, ACCUPLACER scores and an application. Providing academic paths for those seeking an associate's degree or a bachelor's degree in criminal justice, Mount Mary College is accredited through the Higher Learning Commission. As a faith-based institution, the program incorporates catholic viewpoints and values, as well as a focus on human behavior as a foundation of understanding the criminal justice field. Combining small class sizes with off-campus opportunities, the program incorporates events, internships, a senior seminar to offer myriad situations where students can apply their knowledge. The study abroad program offers an additional layer of experience for many students and provides an additional learning resource. Dakota Wesleyan University is accredited by the Higher Learning Commission to award associate and bachelor's degrees in criminal justice. Learning resources include academic advisors are available to assist students in determining major declarations and career path options, while the Center for Talent Development provides guidance for internship placement with local organizations and agencies. Small class sizes allow increased student-teacher interaction, and the option to engage in a research assistant role fosters an additional knowledge acquisition opportunity. Offering a minor in forensic science and investigation paves additional career path options for students within the criminal justice major. Major and minor degree options are offered in criminal justice at the University of Sioux Falls. As a faith-based university, academic programs are centered on Christian values and the university seeks to promote a mission of service. The criminal justice department offers a mentoring program in which university students mentor elementary students. The core curriculum is combined with service-based opportunities such as this, in addition to internships and the National Mediation Tournament, to foster a multifaceted academic foundation to facilitate successful careers within the criminal justice field. Programs are accredited by the Higher Learning Commission. The University of South Dakota offers undergraduate and graduate criminal justice degree options, as well as a criminal justice minor. Flexible options for completion include online course options for both undergraduate and graduate degree completion. Additional program resource and opportunities include travel to conferences, tours of federal and state agencies, college credit for internships with local organizations, research in collaboration with professors and mentors, and a mock trial team which allows for practical experience in simulated roles within all facets of the industry. The liberal arts-centered university is the oldest in the state. When looking for the right school, it can be difficult to know where to start. The search tool below can help. Click to find criminal justice schools in South Dakota based on specific criteria that will help you make your decision, such as location, school type, student population, and degree levels offered. Many students attend criminal justice schools in South Dakota because they want to help people or they have an interest in law. While these are strong motivations, the viability of getting a good job is also an important factor. The table below shows how many jobs are held in specific areas of criminal justice, as well as the salaries these professionals make and the education level needed to get employment. Can students who graduate from criminal justice schools in South Dakota make a good living? Can they expect job stability in the coming years? Based on the data below, the answer to both of those questions is yes. The tables in this section provide a look at the salaries that professionals in specific subsections of the criminal justice field earn and the amount of job growth projected. Also, South Dakota’s numbers are compared to the national averages to illustrate how the state stacks up against the nation. The potential employers that may hire criminal justice graduates are as diverse as the field itself. Review the table below to get an idea of where the jobs are for those in the protective service and legal professions. In addition to specific employers, there is information on which cities have the most job opportunities and the average salaries in those locations. The state’s official website includes information on how to own and operate a business in South Dakota—from applying for a business license to filing taxes. This report from the U.S. Small Business Administration includes information to help small businesses succeed in South Dakota. Topics covered include getting capital, winning government contracts, and writing a business plan. This is the South Dakota Branch of the U.S. Small Business Administration. Website includes information on topics such as franchising, obtaining loans, and business structures. This webpage is dedicated to improving and growing business infrastructure in the state of South Dakota. Members can connect and take advantage of helpful resources supplied by the site. The mission of the GOED is to retain and expand businesses and develop new businesses and job opportunities. The GOED is particularly interested in attracting the bioscience, financial services, outdoor and value-added agriculture industries. The office of the SDSOS provides numerous business services including report filings, business entity search and more. Those who are interested in working for the South Dakota Department of Corrections can find job listings on this page. Includes information about the corrections system in South Dakota, such as the programs developed by the agency, victims’ services, and parole procedures. This page provides resources and information for the public about the state Juvenile Corrections System. This government page offers information about parole service offices around the state of South Dakota. Includes information on the Court’s opinions, docket, and rules. Provides information on the different kinds of courts in the state and their functions, jury service, and State Supreme Court decisions. The SDCRA provides continuing education, networking, oversight of a pro bono program and standards of ethics for court reporters in the state of South Dakota. The Sioux Falls Chapter of the national Court Appointed Special Advocates (CASA) program serves the community by assisting children who have been abused or neglected to promote their best interests. Their ultimate goal is to place children in safe, permanent homes. The legislature’s website includes information about yearly legislative sessions, the work of lawmakers, and administrative rules. Since 1989, the South Dakota Paralegal Association (SDPA) has been committed to the growth of the state’s professionals. This organization promotes high ethical standards for trial attorneys in South Dakota. Member benefits include advocacy support, continuing education courses, and news that impacts the industry. The state bar offers resources to attorneys, such as continuing education courses. The organization also provides information for the public to help them find a qualified attorney and understand their rights. The South Dakota Attorney General’s office is responsible for several legal functions, including working on missing persons’ cases, testing forensic evidence, and providing training to law enforcement professionals. This firm provides services to low-income clients and specializes in the unique legal needs of Native American clients. Includes information on the mission and work of the state highway patrol office. Members receive training and support through this organization. Founded in 1953, the South Dakota Sheriffs’ Association provides support and training to members of the law enforcement community. Also offers $500 scholarships to criminal justice and law enforcement students. This government page provides answers about how to become a law enforcement officer, private investigator, polygraph examiner and more in the state of South Dakota. This Attorney General page offers resources for future and current law enforcement officers. This page has job listings for the South Dakota Game, Fish and Parks department. Agency that is responsible for monitoring and assessing South Dakota’s natural resources, and creating environmental regulations. The South Dakota Parks and Wildlife Foundation has been working to protect the state’s natural resources since 1985. This page provides information and resources for crime prevention when it comes to South Dakota’s natural resources. This is the local affiliate of the National Wildlife Federation. This Department of Agriculture page provides information and resources about preventing wildland fires, as well as information about the department fire investigation team.